Pesto sauce originated in Genoa and many times when you see a dish 'alla Genovese' it is because it contains pesto. This recipe uses a pesto with tomato which is more common in Sicily. The addition of the pesto is what makes this dish so flavorful. Note that all ingredients do not go into the pot at one time but in a sequence. By first sauteing the onions, you produce the essential underlying flavor which is later imparted to the other vegetables. You also add the most tender vegetables last so that they don't become too soft. Heat the oil in a large stockpot. Add the onions and saute over low heat for 5 minutes. Add the leeks, potatoes, carrots, salt and pepper. Saute another 5 minutes. Add the chicken broth and saffron. Bring to a boil then reduce heat. Cover and simmer for 30 minutes. Add the green beans and zucchini. Break the linguine into 1-2 inch pieces and add to the soup. Cook for 15 more minutes. Just before serving, stir half of the pesto into the hot soup. Top individual serving with Parmesan and pass additional pesto. Put the garlic, basil, and Parmesan in a food processor and puree. Add the tomato paste and olive oil. Puree until combined. Heat the oil in a saucepan over medium-high heat. Add the onion, pepper, seasoning, and garlic. Sauté 5 minutes. Add the spinach, beans, broth, tomatoes, and artichokes. Bring to a boil, reduce heat and simmer 2 minutes. Add the tortellini and simmer until the tortellini are tender, usually 8-10 minutes. Serve in individual bowls. Sprinkle each with Parmesan. Heat oil in a stockpot over medium heat. Add garlic, onion, carrot, celery, and cabbage. Sauté 8-10 minutes. Add beans, tomatoes, broth, parsley, basil, and oregano. Bring to a boil, reduce heat, cover, and cook 1 hour. 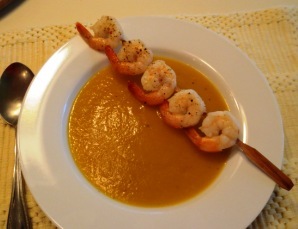 Transfer about 1-1/2 cups of the soup to a food mill or blender and puree. Return the puree to the soup and add pasta and red pepper. Salt and pepper to taste. Cook an additional 15 minutes. Add water if the soup gets too thick. Serve. 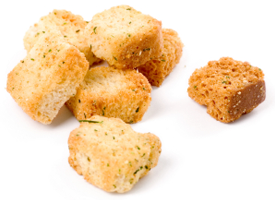 Transfer the croutons to a plate and sprinkle them lightly with grated Parmesan cheese. You can serve them immediately or allow them to sit for up to 30 minutes. There are three Italian words for soup. 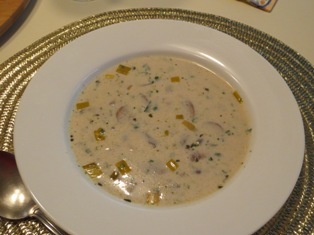 Zuppa is generally used for simple soups, minestra is for a more substantial soup, such as a vegetable soup, and minestrone is considered to be a very substantial or large soup. People often ask for a "classic" minestrone recipe but there is none. Every region, city, town, and practically every family in Italy has its own version. In Genoa, for instance, pesto is added to the traditional regional minestrone. The important factor in making a a good minestrone is that fresh seasonal vegetables be used. So naturally the ingredients of minestrone will change with the seasons. Feel free to substitute vegetables in these recipes for what is available in your area. Bone broth is one of the most popular trends in health and fitness right now. People are drinking it to lose weight, improve their skin and nourish their joints. It is made by simmering animal bones (typically chicken bones, beef bones, or a combination of the two), in water for anywhere from 12 to 48 hours on the stovetop. Trim about 2 inches off the base of the broccoli stem. Peel the stem with a vegetable peeler or paring knife. Cut the broccoli florets from the stem and cut them into bite-size pieces; set aside. Cut the remaining stem crosswise into 1/4-inch thick slices. In a large saucepan, cook the garlic in the olive oil over medium heat for 1 minute. Add the sliced broccoli stems, water, and salt to taste. Bring the mixture to a simmer and cook for 30 minutes until the broccoli is very tender. With a slotted spoon, transfer the cooked stems to a blender or food processor. Process until smooth. Return the puree to the water in the saucepan. Bring the mixture to a simmer and add the broccoli florets and pasta. Cook for 10 minutes or until the pasta is tender. 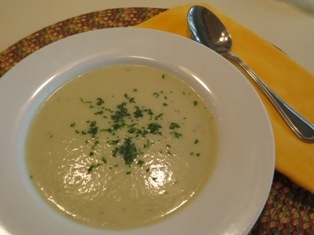 Stir in the parsley, a generous amount of pepper, and 1/4 cup of the Parmesan cheese. Check the seasoning; add more salt if necessary. Serve with additional Parmesan cheese sprinkled on each serving. With a generous 28-ounce capacity and wide mouth for easy access to contents, these soup mugs with handles allow for a steadier grip for less mess. Perfect for soup, hot and cold cereals, chili, mac and cheese, and desserts.